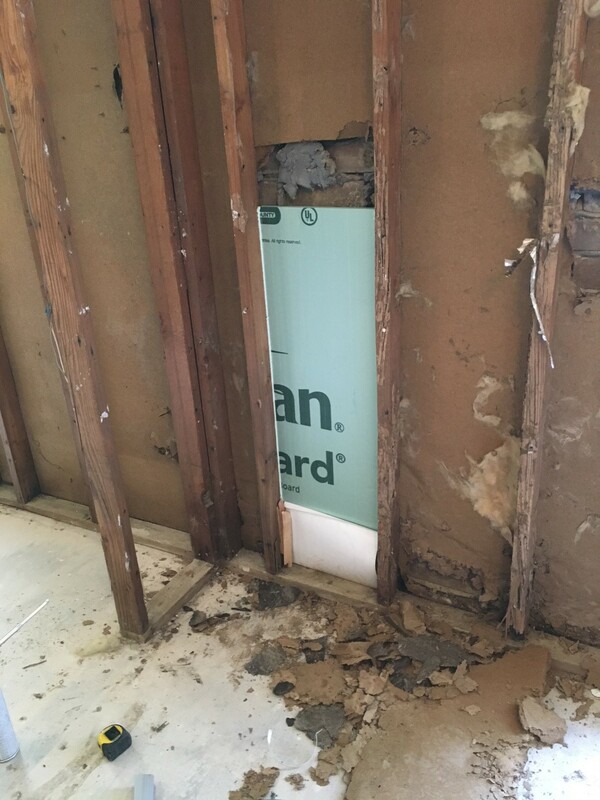 After a flood, it's now common knowledge that it's necessary to promptly remove floorings (except fully adhered ceramic tile), open walls and discard wet insulation. The next steps in restoration can spawn many questions, and answers unfortunately tend to vary from source to source. The “best choice” restoration method depends – on the type of construction and materials of the home, the level of damage, location, the budget and resources available, and the goals of the owner. That’s a difficult but important balancing act and decision process. Although a one size answer can’t fit all situations, following are 23 frequently asked questions, and unbiased information we offer based on building science principles and practices, to help home owners, contractors and workers make informed decisions. If all is now clean and dry, you could skip down to questions 13-23. 1. My home is gutted above the flood level. Now what? Get it safe, clean and dry ASAP! For a detailed how-to guide, download and refer to Rebuild Healthy Homes: Guide to Post Disaster Restoration for a Safe and Healthy Home – a free mobile app for your smart phone, and a free pdf publication online. HAZARD ALERT! If your home was built before 1978, it could have lead based paint and asbestos containing materials; the older the home, the more likely the hazard. Disturbing such materials can create a much greater health hazard than existed before. If the tear-out process didn’t follow lead-safe work practices, it’s not too late to do a lead-safe clean-up. Wear personal protective gear, including a NIOSH certified N-100 respirator. Do not use a typical vacuum cleaner, since they blow fine dust into the air. Use a HEPA filter vacuum and damp wipe methods. Learn more in the Rebuild… guide and at www.epa.gov/lead. Hire only EPA Lead-Safe Certified contractors to help. 2. Does bleach kill mold? Should I clean with bleach? Since floodwater is contaminated with sewage, and possibly other biohazards, it is recommended to clean first with a detergent solution, then disinfect surfaces before the drying process. Disinfectants also pose hazards, some more than others. Always read the warning label and follow directions carefully. Household chlorine bleach is a readily available, inexpensive disinfectant. It can kill a wide range of bacteria and mold IF the surface is cleaned first, the solution is the right concentration, and there is enough contact time. However, bleach is quite corrosive so should never be used on metals or near the air conditioning system and it poses a variety hazards to people (burns, asthma trigger, etc.). It also has no residual effect, so does not prevent new growths of mold or bacteria if conditions remain damp. Bleach should never be mixed with ammonia or an acid (like vinegar) since that can create toxic gas. 3. What should be sprayed in the wall cavities, subfloor, etc.? The best practice is CLEAN and DRY. Mold and bacteria do not grow on clean and dry materials. That said, it can take time to get everything dry enough. Also, disinfection is recommended after flooding due to potential sewage contamination. All disinfectants pose some hazard, but some more than others. Investigate the hazards and read warning labels of any disinfectant, fungicide or fungistatic product before use. Some types have ingredients that are known or suspected carcinogens; some can be asthma triggers; some are corrosive; and, they vary in effectiveness. If the materials must be dry before application, then dry materials will not support new mold growth anyway. Having wood framing and subflooring exposed does offer a valuable opportunity to treat structural woods with a borate solution that penetrates the wood to provide long-term, effective and safe protection from termites and decay fungi. Boron based products tend to also help deter new mold growth, although they may not be formulated or labeled for that. Do not apply anything that would impede drying to the indoors. If you want to use a fungicide (to kill mold) or fungistatic (to prevent new growth) or even a paint coating, make sure it’s very water vapor permeable (perm rating of at least 5, prefer 20 or higher). 4. Does flooding affect my termite treatment? Is re-treatment needed? Most chemical soil treatments are not water soluble, so they remain in the soil. However, if any treated soil is washed away or covered by deposits of silt or mud, the chemical barrier is no longer effective. Flooding may also have an adverse effect on termite bait systems; saturated material in the bait stations must be replaced. Note also that soil treatment chemicals currently available last only 5-15 years, and retreatment is needed when they expire. Gutted walls offer a rare opportunity to see normally hidden termite damage and infestation, and correct moisture intrusion problems that attract termites. As mentioned above, it’s also an opportunity to apply a penetrating borate treatment to structural woods for termite and decay protection, especially if there is evidence of previous infestation. 5. Who should I hire to remediate or apply treatments? Professionals with specialized equipment and training can provide safer, faster and more effective cleaning, drying and mold clean-up services than doing it yourself. Always check credentials and experience. Louisiana law requires that anyone hired to remediate significant mold must be a La. licensed Mold Remediation Contractor who has completed an approved education program and met other requirements. Search licensed Mold Remediation contractors at www.lslbc.louisiana.gov. Also, anyone hired in La. to apply an anti-microbial product (such as disinfectants, fungicides, mold treatments, etc.) is required to have a Microbial Pest Control certification through the La. Dept. of Agriculture and Forestry. For this 2016 flood emergency, pest control operators with other certifications are temporarily authorized to apply anti-microbial treatments. They can also apply borate treatments and other termite and household pest controls. 6. So how should mold be removed and prevented? Today, most mold remediation national standards and protocols rely upon cleaning away mold, rather than just killing it, and speed drying. Dead mold spores and remnants have the same health effects as live mold, so it’s better to remove it than just kill it. Non-phosphate all-purpose cleaners or detergents are recommended for cleaning since phosphate residues can be a food source for new mold. Once cleaned, the safest AND most effective solution to prevent mold is speed drying wet materials. To clean as safely and effectively you can, read and follow the 10-step Mold Removal Guidelines and Storm Damage Clean-up Highlights on the www.LSUAgCenter.com website or from your parish LSU AgCenter Extension office. 7. What is “speed drying”? I’m using fans, so why is it taking so long? Well, I made up the term speed dry. It means using every means available to dry wet materials as quickly as possible, ideally within days, to prevent new mold colonies from forming. Drying is slow to non-existent when the relative humidity (RH) of air around the material is high (70% and higher). The lower the RH, the faster materials dry. Dry air pulls moisture from materials. Fans help evaporate surface moisture, but blowing around humid air doesn’t do the job. Also, warm materials dry faster than cold materials. Your goal is to create a drier indoor air environment that will cause moisture to transfer from the wood and concrete slab to the indoor air. However you need to find a balance that allows drying, but not so fast to cause cracking and checking of the wood millwork/trim that didn’t get wet. Keep windows and doors closed, seal air leaks and duct leaks as much as you can (since outdoor air is humid), and remove moisture sources (houseplants, water in toilets, etc.). Cover drains to block sewer gas from entering home. Trim landscaping away from walls, eliminate sprinklers, and expose at least 6 inches of slab or foundation under siding. Run the air conditioner (A/C) at about 72 degrees, auto fan setting (to avoid returning condensed moisture back into the air); do not overcool since that can backfire by raising RH and making materials cold enough to cause condensation; change return air filters often. Get and run dehumidifiers on low RH setting, with a hose to discharge into a drain or outside; locate near fans to help distribute dry air; check and change filters often. If you can’t get dehumidifiers, run electric space heaters at the same time as A/C; the heat will lower RH, keep materials warm, and make the A/C run longer to increase dehumidification. Run ceiling fans and portable fans to blow low RH air across damp materials. Get a digital hygrometer to monitor the indoor RH; keeping air below 50% RH will allow drying, but 30-40% is even better until all is dry. Monitor RH with just A/C for a few days, if possible, to see if RH stays below 60% without the dehumidifiers or heaters. If not, run them longer. 8. How do I know when it’s dry enough to restore? You can’t tell by appearance or time spent drying. A reliable, professional-grade, calibrated moisture meter is recommended to measure the moisture content of flooded materials. The newer recommended wood moisture content target is 15% or lower, because higher levels could possibly support mold growth. Take readings with a pin type meter at various locations in both the middle and edges of wood studs, bottom plates, wall sheathing and subflooring. Note that treated woods (bottom plates) can produce false readings on some meters. Previous guidelines cited a 19% target because that’s the national dryness standard for framing lumber. Wood with higher moisture content is vulnerable to decay fungi, a structural risk. Note that a flooded concrete slab soaks in water like a sponge. A wet slab can lead to flooring failure and rewetting of wood framing. To monitor slab wetness, use a pinless moisture sensor, if possible. Otherwise, as a rough DIY indicator, tape an 18 inch square piece of clear plastic sheeting on the concrete. Monitor for 24 hours, then if visible moisture collects under the plastic, the slab is still wet. Also inspect for wood decay and termite damage, and repair or replace damaged and soft wood before proceeding. 9. Do I need a “clean home certificate”? 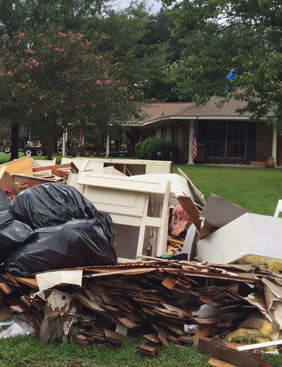 There has been a major buzz about “Clean Home Certification” requirements for flooded homes. This is new, so we asked reps of FEMA, SBA, building officials, lenders, the insurance commission and attorney general’s office in Louisiana, and found NO such requirement. We did, however, learn that scam artists have charged worried homeowners large sums to do an inspection and provide a “clean home certificate” they claim is required. What we DO recommend is to document (with date stamped photos and written records) the clean-up procedure used and to keep a moisture log of moisture meter readings, showing that wood framing reached the recommended 15% moisture content before restoration. That can provide reassurance for the homeowner and to prospective buyers, renters and lenders in real estate transactions. Legitimate, licensed or certified mold remediation contractors may provide a “clearance” report of the effectiveness of the remediation and some lenders or insurers may want a copy of it on file. 10. What’s that material between the studs and bricks (or siding)? Is it needed? Most houses with insulation also have sheathing, typically 4x8 ft. panels, attached to the exterior side of studs. It has several purposes in addition to being a backer for installing insulation. It may have black building paper, housewrap or other weather barrier material on the exterior side to serve as a “drainage plane” to protect wood and insulation from wetting. It may also provide some of the structural capacity needed to withstand wind forces. Exterior grade plywood is resistant to floodwater damage. There may be swelling, but it tends to recover if in good shape before the flood, and retain much of its structural strength. Few homes have lumber board sheathing, but it can be very resilient. Most oriented strand board (OSB) is not considered flood resistant, but quality and performance varies widely. It may lose some structural capacity and is slow to dry; if it swells or delaminates, it doesn’t recover. “Blackboard” or “fiberboard” was used in many older brick homes. It is a wood fiber or other cellulose fibrous product with asphalt, resin or other binders added. It is not flood resistant; wetting causes loss of strength and it tends to be very slow to dry. Long term wetness can result in unhealthy mold growth inside the material. If it was not protected with building paper or other type of weather barrier, it may be even more vulnerable to adverse effects of the flood. It's typically best to replace flooded fiberboard. Exterior gypsum (“gyp”) board sheathing with paper facing on both sides was used in some older brick homes. Long term wetting can reduce strength or cause it to crumble, but it may be OK after short term flooding. Wet paper facing is prone to mold growth, but gyp can dry quickly (potentially before mold growth occurs or penetrates). The next set of FAQ’s addresses wet and damaged sheathing issues. 11. The studs are dry, but not the sheathing/subfloor. What should I do? Composite wood materials made with resins, wax, asphalt, glues, pressure, etc. are slower to wet and slower to dry than dimensional lumber (wood cut from a tree). Oriented strand board (OSB) panels may take twice as long as studs to dry. Blackboard may be even slower to dry. Continue speed drying with dehumidifiers and aim fans to blow low RH air on the wet sheathing. Take moisture meter readings in different spots each time (don’t use the same pin holes) and keep a “moisture log” of readings over time. Moisture moves from wetter to dryer areas, trying to equalize, so a spot at 15% one day might read higher at a later date if other areas were wetter. Wait for equalization to stabilize before giving up the dehumidifiers. 12. Must siding be removed to help exterior sheathing dry? When the interior is air conditioned so it's cool and low humidity inside and warm and humid outside, the direction of drying is almost entirely toward the inside. So it would not be helpful enough to justify the cost of removing siding just to help dry sheathing. Nevertheless, it is recommended to remove any horizontal caulk between lap siding boards since it impedes airflow and drying. Only vertical seams should be caulked. However, if sheathing is substantially decayed, damaged, missing or infested with penetrated mold or insects, removing siding to replace sheathing and install an effective weather barrier (such as housewrap) may be warranted. 13. What’s that black plastic/tar paper at the bottom of the wall cavity, between the studs and sheathing? What should I do with it? In brick veneer homes, it’s a flashing that extends to the brick ledge and under the bottom course of bricks. It’s there to protect the framing and insulation from water that drips and collects behind the bricks until it can drain out of the weep holes. However, the visible part of the flashing between studs and sheathing is actually an incorrect placement that was common in years past. That placement tends to result in the bottom of the sheathing getting and staying wet. If sheathing behind the flashing is soft, crumbly, delaminated or has penetrating mold, the damaged sheathing should be cut out. If only a small section of damaged sheathing is cut away, it should be replaced with a material that can withstand water. One good option is rigid foam board (such as extruded polystyrene or XPS); it can be cut to fit in place of the removed section of sheathing and secured with a foam compatible caulk around its edges. Since XPS is water resistant and can serve as the weather barrier, locate the flashing between the studs and XPS (as it was before). If the sheathing behind the flashing is undamaged and will be retained, the flashing must be held away from the sheathing to allow air access and drying. One way is to slit the flashing about 2 inches from the studs, fold down the flap until the sheathing is dry, then repair it with asphalt-based, adhesive window flashing tape on both sides of the slits to restore it. Or, you may trim away the top part of the flashing to clean behind it and allow drying, but leave 3-4 inches to protect insulation from water that drains behind the bricks and insert shims or other spacers between the flashing and sheathing to allow air to reach the sheathing during dryout. If the flashing is cut off, or damaged when removing sheathing, it should be replaced. Flexible, plastic, non-adhesive flashing can be used; do not use metal flashing in contact with cement or pressure treated wood. Alternatively, a Z-flashing could be placed on the bottom plate, tucked under the brick ledge flashing. It's best for flashing to be installed to continuously cover the brick ledge and fold up on the exterior side of studs. However, mortar protrusions and sheathing remnants on the studs can make this difficult and impractical to achieve. If flashing replacement is limited to sections between studs, it should be sealed in place on the interior side of the WRB. 14. What should be done with brick weep holes? Quite a bit of rain water goes through bricks and drains down the gap between brick veneer and sheathing. That’s why brick veneer should have weep holes in the bottom course that allow water to drain out. It’s best to also have weep holes or an open top behind the top course of bricks to allow air flow, which helps drainage and drying. It’s common for bottom weep holes to be clogged with mortar droppings behind them and debris in them. Clean out debris. A drill may be helpful to reopen weep holes and improve drainage. It’s best to remove as much of the mortar droppings at the bottom of the gap as you can, since it creates a dam that could lead to pooling of water and wetting of framing or insulation. If there are no weep holes, remove mortar between every third brick on the bottom course. 15. When damaged sheathing is removed (since it’s rotten, soft, crumbly, slow to dry, mold-infested fiberboard, etc. ), but there are brick ties on the studs, how can it be replaced? Replacement is important, but the brick ties are in the way of attaching new sheathing to the exterior side of the studs. Any method and materials used need to create an effective “drainage plane” (water barrier system) to keep the substantial amount of rainwater that gets through brick from wetting insulation and wood. There also needs to be a drainage gap to allow water to drain down and out the weep holes. If water cannot drain out, the bricks are likely to stay wet enough to grow unsightly algae and cause a maintenance problem. If the existing sheathing provided a structural function, a means to replace that structural capacity is also needed. A structural engineer, architect or building code tables can help determine needed “shear load” (to resist racking or leaning) and if the sheathing or other methods (such as corner bracing) provided it, or need to be added. The higher the wind zone, the more load capacity needed. The “best practice” is to remove the brick veneer and brick ties, replace sheathing from the exterior with plywood or other flood-hardy material, install a weather barrier (house wrap, liquid applied, or other type) properly integrated shingle-fashion with new window and brick ledge flashings, then install new brick veneer, siding or other finish. This is costly, but offers the best and lowest risk restoration. 16. I can’t afford to remove and replace the brick veneer to replace damaged sheathing, so now what? Many homeowners and contractors have grappled with what to do when they just cannot financially manage the best practice approach of removing brick veneer to replace sheathing and weather resistant barriers (WRB). Alternative sheathing replacement methods (whether partial or full height) are being used. With any method, sections of damaged sheathing should be cut out above the damage or wetness line. If retaining the brick ties, cut sheathing along the inside edge of studs so sheathing strips remain on the exterior side of studs, to retain the full base of support for the brick tie fasteners. In many cases, the residential brick ties are damaged or the type used doesn't really provide an effective load transfer function (to resist wind forces), so removal of the ties may be a reasonable choice that offers easier and more robust restoration options. If damage is only on the bottom few feet of a wall, it may be structurally unnecessary to replace removed brick ties on some houses (consult a structural professional). If replacement is needed or desired, retrofit brick ties are commercially available. One type is installed from the inside into bricks (held with epoxy) and fastened to the side of studs; another type can be installed from the exterior by screwing a pin-type tie through mortar joints into studs. Flashing is repaired or replaced to protect wood bottom plate and bottom of studs from draining water -- either with: (a) non-adhesive, plastic flashing covering the brick ledge and extending up the exterior side of the stud a few inches, or (b) liquid applied or adhesive flashing tape covering the bottom plate, brick ledge and extending up the studs about two inches. Strips of “rainscreen” product (drainage mat with bonded facing on interior side, or similar) or attic ventilation baffle products are placed against the interior side of the brick veneer. This maintains air and drainage space for the brick veneer, so rain water that goes through the brick can drain down and out the weep holes so bricks can dry. If retaining brick ties, it's preferable to cut the rainscreen strips wide enough to meet behind the studs (i.e. 16 inches wide for typical 2x4 framing), then cut notches in the rainscreen to fit around the brick ties so as to provide full coverage on the brick veneer. If mortar protrusions leave no gap behind the studs (with remaining pieces of sheathing on them), then the rainscreen can be cut to fit between the studs, using either tape or construction adhesive to hold it in place for foam application. If brick ties and nails are removed, sheets or rolls of mesh-type rainscreen can be fed horizontally between the studs and brick to provide continuous coverage. Closed cell (cc) spray foam (2 lb. foam) is installed by a qualified professional to fill the remaining space between the studs and rainscreen, plus a 2-inch thick partial fill between studs. The cc spray foam clings to the framing and rainscreen facing, cures, and hardens. This method can be used if brick ties and nails are removed. Flashing is repaired or replaced to protect wood bottom plate and bottom of studs from water -- either with: (a) non-adhesive, plastic flashing covering the brick ledge and extending up the exterior side of the stud a few inches, or (b) liquid applied or adhesive flashing tape covering the bottom plate, brick ledge and extending up the studs about two inches. Shims or wedges made from 1-inch XPS foamboard are tacked to the brick veneer aligned with the studs, as needed to hold the thin XPS against the studs. Shims may not be needed where mortar protrusions remain, but should be applied at the bottom course of brick where mortar droppings have been removed to allow good drainage through weep holes (see # 14). 1/4 to 3/8-inch thick, fanfold, XPS foam sheets (8 feet long) are run horizontally between the studs and the wedges, lining the exterior side of the studs where the sheathing was. The XPS sheets are a water resistant material that servces as the WRB, so it should be layered shingle fashion. Closed cell spray foam is professionally installed between studs to a thickness of two inches. Closed cell spray foam cures to become a water resistant material with low permeability, so it protects wood framing from water. Cured cc foam (2-inches thick between studs) adds substantial structural capacity (shear load or racking resistance) to compensate for loss of structural sheathing. Two inches of cc spray foam also provides R13 insulation and creates an air tight system for energy efficiency. 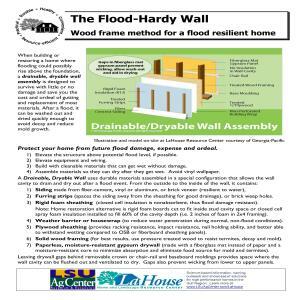 Properly installed, it can create a “flood-hardy, washable, drainable, dryable wall” that could be cleaned and retained after a flood, avoiding need for replacement. For enhanced cleanability, coat the cc foam and studs with latex paint with a high water vapor permeablility (perm > 5, perm 20 preferred so as not to impede the drying of wet wood). Spray foam application is rapid, which may reduce restoration time and labor needs. Corrugated, residential brick ties in the bottom area of a brick veneer may provide little functional reinforcement, so may not need to be replaced if damaged or removed. However, check with your building official or structural adviser for what is needed for brick veneer stability. Rainscreen against the brick veneer ensures a clear drainage path, regardless of mortar obstructions. 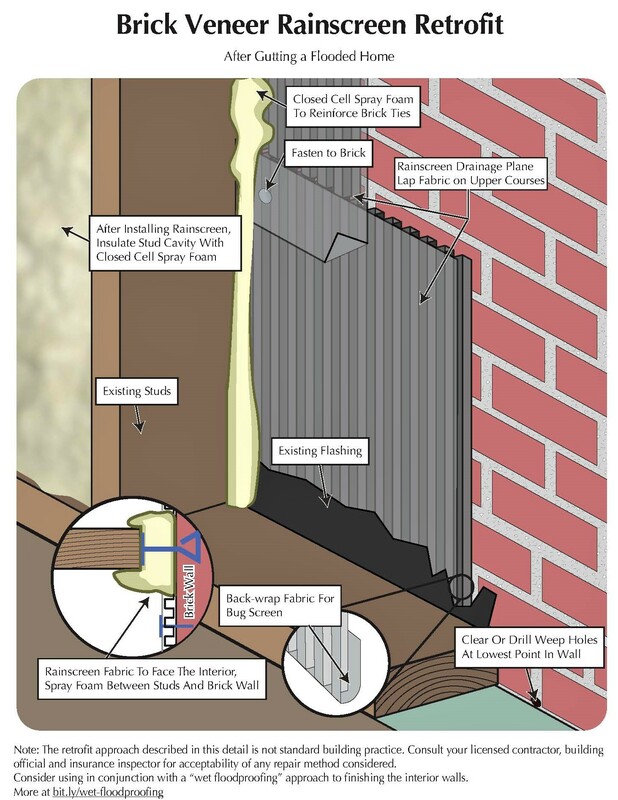 The cc foam fills gaps behind studs, protecting wood from wetting at gaps between sections of rainscreen, and providing support for retained brick ties. The rainscreen method allows retention of brick ties, nails and remnants of sheathing behind the studs. This avoids the time and labor of cutting off ties and nails and clearing out space behind studs. It also avoids the need to install replacement brick ties, if deemed necessary. Mortar protruding from brick veneer may affect choice of rainscreen product, due to its irregularity or thickness. A 1/2 inch thick rainscreen provides ample drainage capacity, but since a 1-inch space behind brick veneer is standard in new construction, confirm what your building permit official will accept. (If a 1-inch space is required, it could be achieved via ½ inch rainscreen on ½ inch mortar protrusions, or with a 1 in.attic vent baffle). Rainscreen material must be compatible with spray foam and tolerant of high heat generated by the foam during application. Some products may be easier and faster to install than others, and material costs vary. . Thin XPS fanfold sheeting is a low-cost, lightweight, moisture-resistant material. There must be clear space with no obstructions behind the studs in order to feed the XPS sheet through, which may require considerable labor and time to remove all remnants of sheathing, nails and brick ties. If removed brick ties require replacement, that would require added cost and labor. Cutting wedges, fastening them to the bricks to shim the XPS sheets and feeding the sheeting in the gap may be challenging and labor intensive. Mortar protrusions may interfere with placement of shims for uniform support and clear drainage pathways. Slims should at be used at least at the bottom course of bricks, with mortar droppings removed to ensure drainage through weep holes. Closed cell foam has a low moisture permeability, so will hamper drying of wet materials encased in it. 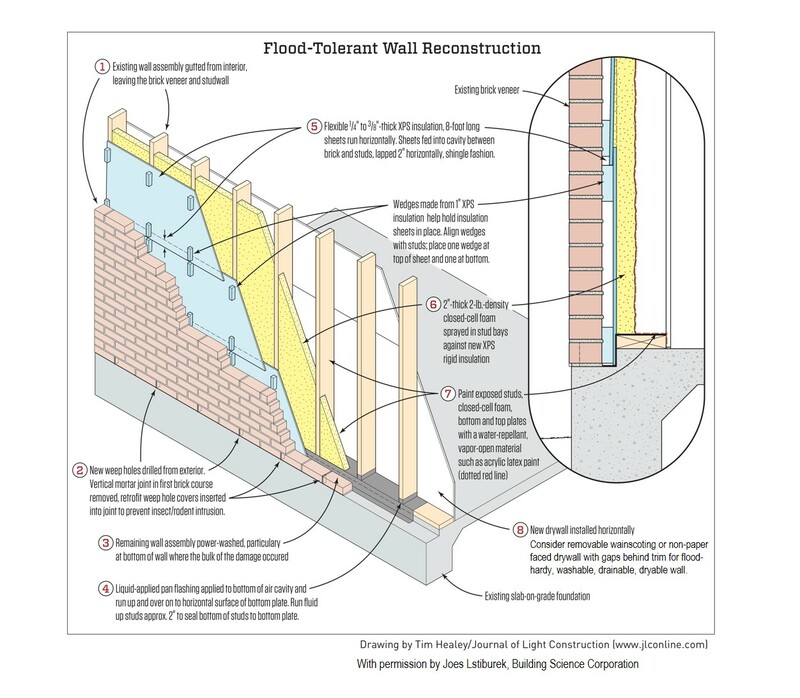 That’s why the cc foam depth should be limited to no more than 60% of the wall cavity, and minimize coating studs beyond that so they can readily dry in the event of another flood. Spray foam should be installed by a professional who is well trained by the product manufacturer or the Spray Polyurethane Foam Assoc. to ensure safety, proper application, curing and good performance. Check credentials, experience and reviews. Do not enter the building until curing is complete to avoid exposure to toxic fumes. Closed cell foam is expensive, compared to other types of insulation. It may not be cost-effective for the applicator to set-up equipment to spray small areas. If cut sheathing does not fully cover exterior side of studs, it’s prudent to protect exposed exterior edges of studs from wetting. The exposed wood edges could be coated with latex exterior paint or liquid applied flashing (better) to help reduce water absorption. Flashing is repaired or replaced with non-adhesive flashing tape covering the brick ledge and extending up the exterior side of the stud a few inches. Extruded polystyrene (XPS) rigid foam board sheathing (1/2 to 1 inch thick) is cut to fit and inserted between studs to the depth of the original sheathing, maintaining drainage space between the XPS and brick (shims may be glued to exterior side of XPS panels to ensure drainage gap, if needed). The XPS foam board should be placed on the exterior side of the brick ledge flashing, creating a shingle-fashion layering for rain water to drain. Edges of the XPS and flashing are sealed to the wood framing with a compatible foam sealant or caulk. This holds and seals the foam board in place, blocking water and air leaks. XPS, a closed cell foam board, does not absorb water so it can serve as the drainage plane weather barrier (WRB). XPS has insulating value of R5 per inch of thickness (higher than fibrous types). XPS foam board is durable, lightweight and easy to handle and cut. XPS is not structural, so does not compensate for loss of structural sheathing’s load capacity. Reinforcement may be needed. This method requires considerable labor and detail work, but the materials are less expensive than cc spray foam, readily available, and feasible to install by general labor, volunteers and do-it-yourselfers. The total cost of materials plus labor for the entire system including insulation should be compared with other methods. Caulk and foam sealant must be compatible with the XPS foam board to avoid damaging it. Attention to detail and good workmanship is important to provide moisture protection and good performance. Studs are not protected from wetting with a durable water resistant barrier. 17. Where can I get a “rainscreen” or vent baffle product to maintain drainage space behind brick veneer? 18. What kind of insulation should be used to replace what got wet? There are many good options to achieve R13 or higher insulating value, but a key recommendation is to use an insulation that does NOT have a “vapor retarder” (such as kraft paper facing) on the interior side. A vapor retarder facing would hamper continued drying to the inside, and is not needed nor recommended in our hot, humid climate. If using batt insulation (glass fiber, mineral wool or cotton), select unfaced friction-fit batts. Ensure proper installation with no voids or compression for good energy-saving performance. Any type of spray applied (spray foam, cellulose, mineral wool or fiberglass) or loose fill insulation properly dense-packed within netting (known as BIBS) provides full coverage with no compression, which performs better than flawed batt installations. A product that does not add moisture is preferable. 19. Should cellulose and cotton insulation be avoided because they’re absorbent? No. In fact, the absorbency can be an advantage. It can increase the “buffer capacity” or moisture storage capacity of the wall – allowing moisture to disperse and gradually dry to the inside. In addition, these insulation products may contain a boron based fire retardant, which is a natural compound low in toxicity that may help deter insects and mold (although the insulation may not be labeled for that). However, all porous insulations (cellulose, cotton as well a glass fiber, mineral wool and open cell spray foam) must be protected from liquid water leaks. If any of them get wet, they are too slow to dry so should be removed and replaced. 20. Does foam insulation cause moisture problems and mold? Doesn’t the wall need to “breathe”? “Breathing” is a misleading and misunderstood term for a building. Don’t use it! A wall or building enclosure that leaks air is not a good thing – it wastes energy (and money), and can cause both comfort and moisture problems. However, it is important for the building assemblies (walls, roof, floors) to drain rain, prevent condensation, manage moisture and allow drying. In our hot, humid climate and air conditioned homes, the direction of drying is toward the inside (cooler, dryer side) most of the year. The most important feature to prevent hidden condensation, moisture and mold is to have a highly moisture permeable interior finish. Gypsum drywall with latex paint is ideal. Avoid (and remove) vinyl wallpaper and oil based paint. Closed cell foam insulations (rigid or spray) have a low permeability, yet their insulating quality prevents condensation (just as a foam cup containing a cold drink doesn’t get wet with condensation, but a glass with the same cold drink in it would get very wet). So closed cell foams can provide an all-season solution to prevent condensation inside a wall assembly. However, closed cell foam and any other material or finish that is not moisture permeable should not fully coat wood wall studs and bottom plates since that could hamper drying after flooding. It can hamper drying of sheathing to the inside during summer, but would not require delaying restoration if it’s air sealed and isolated from the interior; the sheathing would eventually dry to the exterior. 21. What caused my wood flooring to cup before the flood? How should a raised floor be insulated? In a nutshell, raised floors get wet in summer because air conditioning causes a moisture vapor drive from outside to inside (moisture drive is from warm to cool and high humidity to low humidity). Hot, humid air from outdoors picks up added moisture from soil, condenses on the cool subflooring and moves inward. If the flooring is impermeable (polyurethane finish on wood, vinyl or laminate flooring), the moisture cannot dry through to the inside, so the subfloor and flooring gets wet, swells and causes cupping or warpage. Typical insulation methods can make things worse because it keeps the subfloor even cooler (from the A/C), but doesn’t stop humid air and moisture diffusion. If you maintain a high A/C setting (like 78 degrees), have all moisture permeable floorings and good drainage of rain away from the house, you may be OK with standard batt insulation and a ground cover (plastic sheeting) under the house. The batts must be well installed and supported in full contact with the subfloor. It’s also important that rainwater not flow under the house and pool on top of the plastic sheeting. The ground cover can be 6 mil plastic sheeting secured with stakes or gravel on top; no need to tape or seal it. Foil faced rigid foam boards installed under floor joists with seams taped and edges and penetrations sealed airtight. That is hard to do if the floor isn’t at least three feet off the ground. Workmanship must be good, but it’s possible for a do-it-yourselfer. If you hire a pro, it may be expensive. This method provides easy access to remedy a water leak and foster drying after a flood by cutting out sections, then taping them back in place after drying. OR, closed cell spray foam insulation (min. 2 in.) sprayed onto the subflooring between floor joists. If the crawl space is not completely open air, adding a light spray foam coating on joists is recommended. This method is more feasible for limited access crawl spaces and may be less expensive. Timing is important! Do not install the insulation while the subflooring is wet. The best time is after heating the home for several weeks, which reverses the vapor drive and dries out the subflooring. Measure subfloor and wood flooring moisture content with a moisture meter, and insulate after it’s stabilized as low as it will go (10-12%). So the best time to insulate is late winter. 22. If I can’t elevate, is there any way to avoid so much damage and hassle after another flood? removable plywood wainscoting and/or paperless gypsum drywall (fiberglass matt faced) with gaps behind baseboard, crown molding and chair rail trim – to allow wall cavities to be flushed out, drained and dried without gutting. These features don’t bring lower flood insurance premiums, but they can greatly reduce the cost, hassle and time it takes to restore your home and life after a flood. 23. What else should I do or consider during my home’s restoration? The expense, work, time and stress that go into repairing your home CAN have a silver lining. If you restore for MORE than before, you could be rewarded with a more resilient, durable, healthy, energy-efficient and comfortable home. 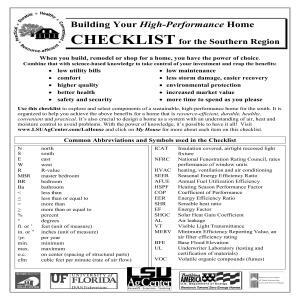 See the Appendix for our comprehensive, updated Building Your High Performance Home CHECKLIST for the Southern Region. Replaced damaged appliances, electronics, lighting and air conditioners with Energy Star labeled models. It pays! Replace damaged doors with Energy Star fiberglass skin insulated doors, with moisture resistant components. Replace damaged windows with low-e Energy Star windows for the deep south (check the label map). 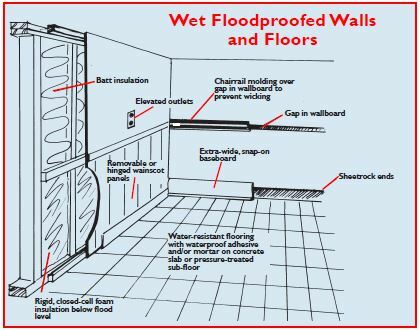 Choose quality fiberglass or vinyl frame units for flood resistance. Insist on proper flashing methods with installation to prevent water and air leaks (don’t rely on exterior caulk). Seal air leaks in walls, floors and ceilings. Foam sealants are great for sealing pipe penetrations. If you need any work done by an air conditioning/heating contractor, include a system inspection, cleaning, AND duct sealing and testing in the scope of work. That can reap big savings in monthly bills and better air quality. Increase insulation performance wherever you can, even if only partial wall height. Install R13 to R15 insulation with no gaps or portions compressed around plumbing or wiring (see FAQ about insulation), and make sure it’s in full contact with an air barrier material on all six sides (not needed for spray foam) so you get the energy-saving performance you are paying for. Replace damaged plumbing fixtures with EPA Water Sense models. Choose light colors inside to reduce need for artificial light, and outside to reduce heat gain. Learn more about how to rebuild a more energy-efficient, durable, healthy and convenient home! Browse the LaHouse Resource Center website (click on My House, My Home), order a copy of the Building Your High Performance Home guidebook, and visit the showcase exhibit house on the LSU campus to explore its many features, displays and information resources. It’s open to the public Monday – Friday from 10:00 - 4:30 – a public service of the LSU AgCenter Extension Service.